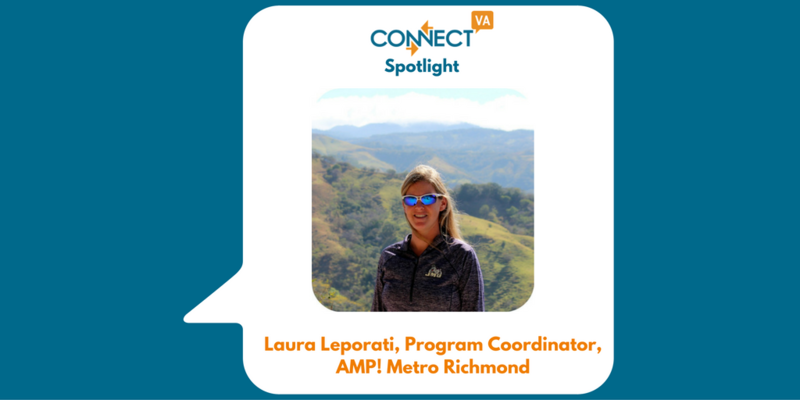 My name is Laura Leporati, and I have served as the Program Coordinator for AMP! Metro Richmond over the last two years. I have a background in psychology and rehabilitation counseling. 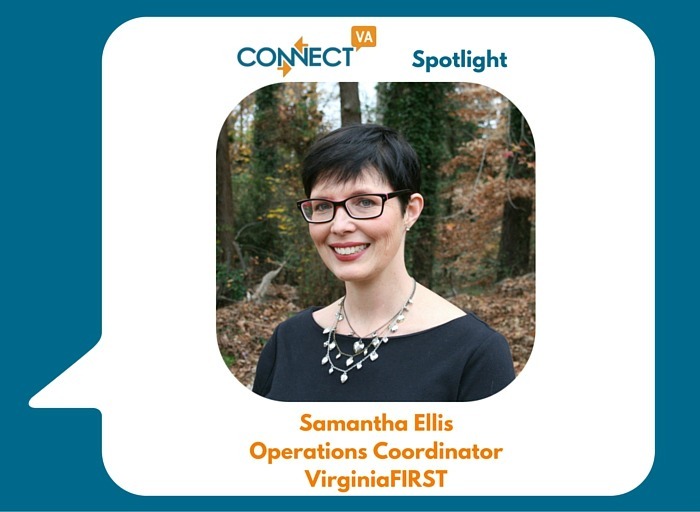 After taking some time off after having children, I entered the world of nonprofits and have really enjoyed working with volunteers and learning about nonprofit development. AMP! Metro Richmond is a school-based mentoring program that operates at Henderson Middle School in Richmond’s Northside neighborhood. AMP!’s mission is to connect students and mentors to amplify perspectives on what can be. Our goal is to create self-confidence, stimulate learning, and encourage career discovery for middle school youths in the Richmond Region. I love seeing the relationships develop between the students and mentors. They are usually a little unsure and timid at the beginning of the year, but by the end of the year, they are very eager to see each other and to share what their week has been like. The most rewarding thing for me is seeing the smiles on the kids (and mentors) faces when they walk into the mentoring room on Tuesdays and greet each other. Every year it is challenging to find the amount of quality and committed mentors that we need for the school year. We have tried to overcome this by completing the Quality Based Membership process through Virginia Mentoring Partnership. We’ve learned that by doing a thorough application and vetting process, that we do find the quality folks that we are looking for. We also strive to create partnerships with businesses, corporations and other organizations in the Richmond area. Mentors in the past have come from Genworth Financial, KPMG, First Market Bank, Bank of America,Chamber RVA, University of Richmond, VCU, VUU, small businesses, nonprofits, and State agencies. AMP! is celebrating our 10-year anniversary this year! We began in 2006 as a project through Leadership Metro Richmond and continue to be a strong program 10 years later. We are celebrating on Tuesday, 8/30 from 5:30-7:30 and anyone is welcome to come help us celebrate! Also, with the new school year upon us, we are looking forward to a new mentoring year. Middle School students at AMP! 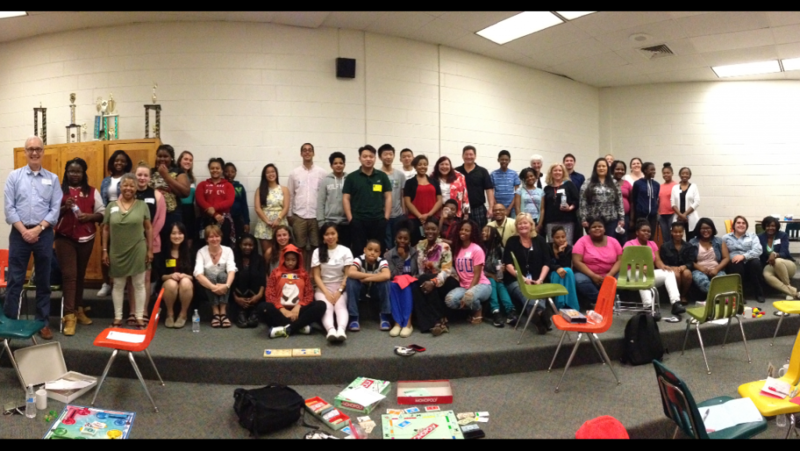 Metro Richmond play board games with their mentors. I actually found this position through the ConnectVA Job Finder! We use the ConnectVA website to advertise events, search for relevant workshops and webinars, to post items needed, and to look for grant opportunities. We are now recruiting new mentors for the 2016/17 school year. Mentoring always takes place on Tuesdays at lunchtime. We especially need male mentors! If interested, please fill out our application and someone will be in touch with you shortly. If anyone would like to join our 10-year celebration on 8/30, please RSVP here. Know someone who should be a ConnectVA Spotlight? Email us at admin@connectva.org for more information!